Wednesday night series have been a true variety of experiences. Four races ago,we had an incredible storm. If you have not seen the picture check it out here - http://picasaweb.google.com/jreadams6.yahoo.com/WNRStorm#5372590092911119762. Lin Gin was the only one that got around the windward mark in time to be going downwind when the storm hit. I believe Harry Gamber stayed in the race, but Laughing Gull went directly to Pussers, and had a few of their rum drinks. The wind may have reached 50 knots. I know that there was a period of time when the boom was sitting in the water. It hit right as Argo, Second 2 Nun and ourselves were at the windward mark. There was a 30 second window when we could have tacked and got pointing the right way, but Second 2 Nun was sitting right there, so until the initial blow was over, we all just headed further out to the Bay. This was followed by a race where the committee set the course slightly long, and only one boat finished - all the others time limit expired. We were sitting staring at the judges when they called TLE - bummer. The committee at least logged me as TLE rather than DNC – not that this buys you anything. Laughing Gull was having a good race too. Not that we caught up to Lin Gin, but someone has to be giving that guy a run for his money. The following week, the race committee over compensated and set the course incredibly short. On top of that, the Committee decided that the Alberg fleet's windward mark was going to be just above the turning point for the faster boats. We were rounding the windward mark and cutting through the Eschels, and the larger boats that all had their spinnakers up - chaos. We all got back into the harbor, and it was anyone's race. On the way into the harbor, we had our chutes up. As we got in - drastic wind shift - our genoas went up and we were close hauled. Some boats went left and Lin Gin and Laughing Gull went right (towards Pussers - for those that need a reference point involving a drinking hole). All was going reasonably well until the wind shifted drastically once again and Lin Gin and Laughing Gull went from somewhere in the front of the pack, to fighting it out for last place. Laughing Gull won that fight for last place. The last race was just right - we could have used more wind, but ... at least it did not rain. Laughing Gull went wide on way to the windward mark, and kept to the Hackett point side of the course. This put us first at the windward mark. On the way back into the harbor, we got tangled up in some Catalinas and Cals, and had to jibe twice to get clear. Towards the mark, we were in the middle of some J105s that were duelling it out. This was interesting, but not good for speed. We rounded the mark in a pack, and right behind us, Lin Gin caught up in clean slice of air unconfused by a herd of 105s with their asyms up. Going into the harbor, the wind dropped, and it was agonizing. At one point Lin Gin was way ahead, and Calliope was catching up nicely. .After a few more tacks I looked up, and Lin Gin was closer, but Calliope was lost in a crowd somewhere off the Chart House. There was not a chance of catching Lin Gin especially after I did not listen to the crew. I even ignored my 10 second rule (when you feel like tacking count to 10). That put us in a position where we had to pinch to finish. We were given a break by one of the fast boats. Laughing Gull was on port. I had the tiller over hard, and was not doing anything there was so little wind - he ducked me on Starboard - which is a good thing as I was a) in the way, and b) completely the burdened boat! There are three more Wednesday nights left. For those that might want to consider a night on the water in the middle of the week, contact J Berquist at jbergqui@gmail.com, he has a good handle on who is doing what. We often have a spot on Laughing Gull, so feel free to ping me as well. Thanks for the great write-up Jonathan! Sorry I fell off the wagon writing these things up... Will try and get back on the horse this week! Jonathan, regarding that race in the storm--we barely made it around that windward mark. 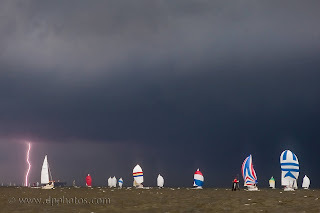 The storm was just kicking in as we tacked to round it when our jib got stuck in our spinnaker pole. Talk about bad timing. It pushed us into the mark and we had to round twice! Thankfully, the storm really kicked in about 30 seconds after we did our second (and successful) rounding. Great times.